“Everybody knows” that you can't get rich from just printing money, except for the part where sometimes you can. Take Japan. Its unemployment rate has fallen to a 22-year low of 2.8 percent — yes, you read that right — due in large part to all the yen it has created the past four years. Money might not grow on trees, but it can get spit out of a central bank's computer. Let's back up a minute. How did Japan get to the point where it needed to give itself the economic equivalent of a defibrillator? Well, back in the early 1990s, it was the first country to go through the boom, bust and stagnation cycle that the United States, Europe and most of the rest of the world have gotten to know and hate so well. Japan managed to avoid a full-fledged depression thanks to all of its infrastructure spending, but it couldn't escape a “lost decade" — a fancy way of saying that while it did grow, it didn't grow much. As economist Brad DeLong points out, Japan didn't just stop catching up with the United States for a few years, but for the last 25. This is both better and worse than it sounds. Better, because once you adjust for the fact that Japan's working-age population has been shrinking, it has grown at least as fast as we have in per-capita terms over the past 15 years. But worse because even then it never made up any of the ground it lost. It had become permanently poorer. This wasn't supposed to happen anymore. Economists, as Nobel Prize-winner Robert Lucas put it in 2003, thought that the “central problem of depression prevention” had been “solved.” They had supposedly learned enough from the 1930s to keep the economy from entering another doom loop of debt, deflation, and default. Until, that is, Japan showed that they hadn't. It had a problem that had not existed for 60 years: It couldn't keep its prices from falling even with zero interest rates. Now, I know this sounds like the kind of thing only an economist could believe — how could lower prices be a bad thing? — but think about it like this: Falling prices would mean falling wages, but not falling debts, so they would become harder to pay back. In the best case, the economy would get stuck in a cycle of low consumer spending leading to low business investment leading to low hiring, and then even lower consumer spending. And in the worst, everyone would go bankrupt. That's why Japan has put so much emphasis on getting its inflation rate back above zero. It wants to get into the opposite cycle of higher prices leading to higher wages leading to lower debt burdens leading to more consumer spending and then more business investment. In other words, a self-sustaining recovery. That has been the whole point of “Abenomics.” That's the shorthand for Prime Minister Shinzo Abe's three-pronged plan — fiscal stimulus, monetary stimulus, and structural reforms like getting more women into the workforce — to get Japan's economy back to where it should be. And while there have been stops and starts, and debates and doubts, the reality is that it is working, emphasis on those last three letters. Which is to say that while Japan might not be where it wants to, it is getting there. Maybe the best way to tell isn't its super-low unemployment rate, but rather its super-high employment rate. That, as you can see below, has shot up since the start of Abenomics to an all-time high of 83.5 percent, making our own 78.3 percent rate look downright measly in comparison. And it means that Japan's unemployment rate hasn't fallen for the bad reason that people have given up looking for work, but for the good one that almost everyone who isn't drawing a pension has found one. It's what unfinished progress looks like. What's behind this boom? It can't be the fiscal or structural parts of Abenomics, because they've barely been tried. Indeed, Tokyo's budgets have actually had more austerity than stimulus the past few years, and its attempts to shake up the country's sclerotic norms and institutions, while making a little headway , have run into quite a bit of resistance from entrenched interests. No, it's the monetary part — Japan's promise to print money for as long as it takes prices to start rising again — that has done the most. But it's still not everything they wanted. Inflation, after all, has only recently crept above zero and is still well below their 2 percent target. The oil crash and an ill-timed sales tax increase kept it in negative territory for a long time. More important than that, though, is the fact that this hasn't made Japan's central bank give up. It has before. 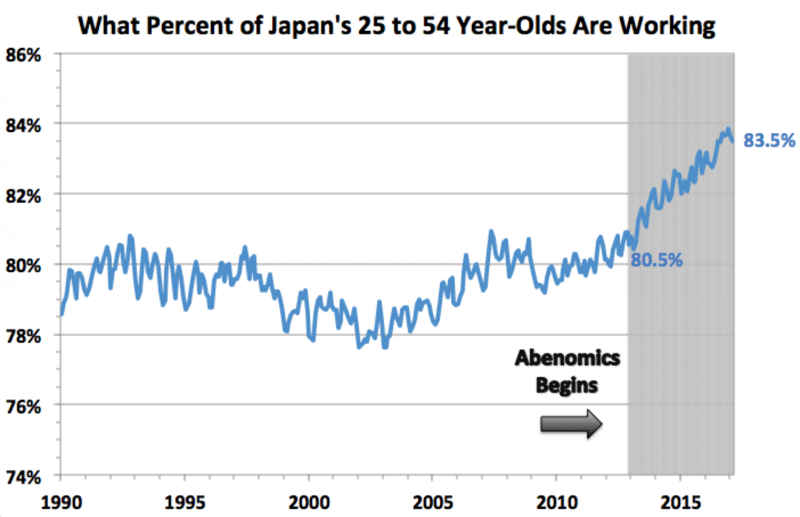 Up until Abenomics, you see, Japan would do just enough to avert the worst, and nothing more. It was one half-measure after another, none of which added up to a whole. What they needed, a then-Princeton professor named Ben Bernanke told them, was the “Rooseveltian resolve” to keep trying things until one of them worked. And now they're listening. All their money-printing seems to have given businesses the confidence — and the cheaper currency — they needed to expand a little more. That's because what had been holding companies back, until a few years ago, was that the government had been doing less than everything it could to support the economy. So now Tokyo is saying it will do whatever it takes, and unemployment has finally fallen so far that businesses should have to start fighting over people by offering bigger raises — potentially giving the economy the push it needed to get into a virtuous circle. And all it would have taken was printing a few trillion yen, which actually isn't that high a price to pay.